damaged goods when their goods are made from fragile materials or mishandled. Stock inaccuracy often occurs. Therefore, BMO Online Inventory Management System is required to keep track all stocks and reduce stock variance to a minimum level. 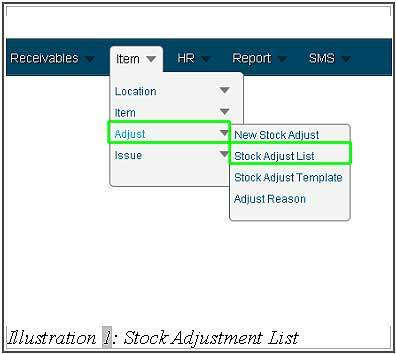 You can view the stock adjustment list in BMO Online Inventory Management System by following the steps as shown below. 1. Click on the “Stock Adjust List” (Item > Adjust > Stock Adjust List) on the navigation menu bar. 2. You can use the “Adjustment List” which filters and displays the your required listing. You can filter by date using “From Date” and “To Date or simply clicking on the “Calendar icon” to pick a date. In addition to that, you can filter through “Item Code”, “Item Desc”, “Branch” and “Inventory Loc” to filter out unrelated items. When done selecting the necessary filters, click on “Search” to see the adjustment list below. “Reset” is to reset the search/refreshing the page. 3. In the adjustment list shown below, you can arrange your results in ascending or descending mode. E.g, Arrange according to latest or earliest date by click on “Arrow” button beside date. Additional features includes, “View” stock adjustment and print by clicking on “Print PDF”. The top “Print PDF” is to enable you to print all stock adjust lists. The individual prints will require you to click on “Print PDF” in the most right column.